Talmudist who with Shallum and Jaekel of Vienna formed a triumvirate of Talmudic scholars in Austria at the end of the fourteenth and beginning of the fifteenth century; uncle and chief instructor of Isserlein, who frequently alludes in his works to the decisions and opinions of his teacher. Jacob Mölln (Maharil) also refers to him and his colleagues. Aaron suffered the death of a martyr, at Vienna, on March 13, 1421. He wrote a digest, "Hilkot Niddah," which is mentioned by Isserlein. 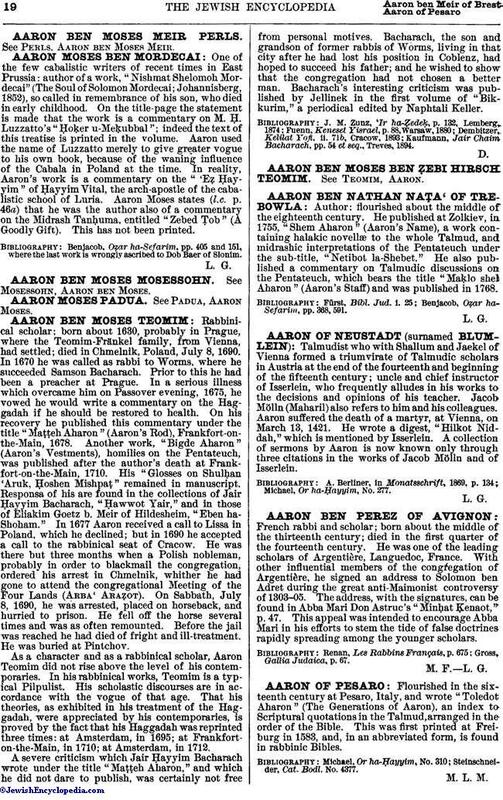 A collection of sermons by Aaron is now known only through three citations in the works of Jacob Mölln and of Isserlein.